The current Wizard Russell Grant leaves the show on 20th May and O’Connor will take over the role for the show's final season from May 22nd to 2nd September starring alongside Sophie Evans as Dorothy. 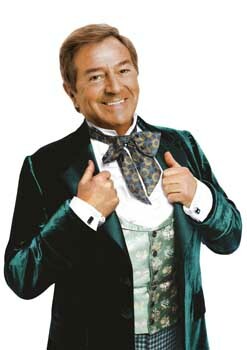 Veteran entertainer Des O'Connor (he's 80) is stongly rumoured to be taking over from Russell Grant as the Wizard of Oz in Andrew Lloyd Webber's production at the London Palladium. Grant leaves on 20th May and the show is currently booking until 28th October with the current Dorothy (Sophie Evans) now staying on until September. The role was originally played by 70 year old Michael Crawford and O'Connor will take over the dual roles of Professor Marvel/Tour Guide/Doorman/The Wizard of Oz. This is only the second time he has performed in a West End musical appearing in Dreamboats & Petticoats at the Playhouse Theatre last year. Since his first television appearance back in 1963 he has starred in his own shows for over 45 years - longer than anyone else anywhere in the world. He is probably best remembered in the West End when he hosted Sunday Night at the London Palladium making over 1000 appearances. His very successful career includes popular television shows (which include Des O’Connor Tonight and The Des O’Connor Show) O’Connor has 36 albums which have sold more than 16 million copies worldwide. Des was awarded the CBE in 2008 for his services to Entertainment and Broadcasting and is widely regarded as one of the best loved and most respected stars in England. It is difficult to imagine somebody like Des with that permanent smile playing the role of the fierce Wizard, but as the show progress's and the Wizard becomes more likeable, then yes, I could see Des putting some life back into the show, good luck Des and all concerned. I loved Michael Crawford as the WOZ and although Russell Grant is entertaining I find his performance a bit over the top. Des O'Connor will certianly bring warmth and humour to the role, but like you I think he will need to practice his scowling! I totally agree, but I do feel sorry for Russell. Michael as a performer has got to be the toughest act to follow.